In October of last year I wrote that Newsday’s paywall would fail to attract new revenue and as a defensive pricing strategy it does little or merit. In the final analysis, this is exactly why it will fail. By creating a pricing plan that defends rather than attacks a market the company is conceding defeat in print and this strategy will have the effect of slowing audience growth online in the one segment that the paper requires, young people. I am willing to give Newsday and Cablevision some credit for being creative with a multichannel strategy that covers TV, print and online, but this pricing plan is a throwback to a subscription model that simply doesn’t work anymore. 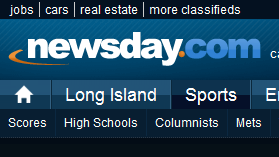 Well the numbers are in and after 3 months of running a paywall, Long Island based Newsday has attracted a whopping 35 subscribers to the website… not a typo, 3-5. Of course now management is running with some creative spin saying it’s 35 more than they expected to get and the pricing strategy was, as I exactly opined back in October, a strategy to defend the existing customer base who are getting access to the web site as part of their cable, prompting one Newsday reporter to observe that “we’re the freebie newsletter that comes with your HBO“. Of course that explanation makes no sense at all because why spend $4m, according to the Dolan’s representative, to redesign and relaunch the website if it’s something extra that subscribers of the core cable service are getting as a freebie? It’ll take them 444 years to recover their investment at this rate.